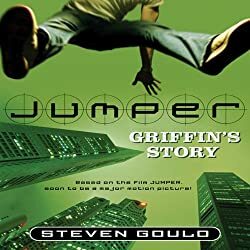 Griffin’s Story is NOT the fourth book in the Jumper series, nor is it the novelization of the movie, it is a stand-alone story that takes place in the Jumper universe. To be correct it takes place in the Jumper universe as portrayed by the movie and not the one by the 3 books in the series with Davy. This story is quite a bit different from the previous 3, to me it feels darker and bolder with more fantasy and drama. That probably has to do with its connection to the movie. That didn’t take away from my enjoyment of the book, but it is different. Ted Barker does a great job with the narration and his voice eventually becomes that of Griffin to me, but I miss Macleod Andrews. Griffin has a secret. It’s a secret that he’s sworn to his parents to keep and never tell. Griffin is a Jumper: a person who can teleport to any place he has ever been. The first time was when he was four, and his parents crossed an ocean to protect the secret. The most important time was when he was nine. That was the day that the men came to his house and murdered his parents. Griffin knows that the men were looking for him, and he must never let them find him. Griffin grows up with only two goals: to survive, and to kill the people who want him dead. And a jumper bent on revenge is not going to let anything stand in his way. Jumper is a major motion picture released by 20th Century Fox in February 2008. I rate this book an 8 out of 10 and recommend it to anyone who likes science fiction and superpower stories. 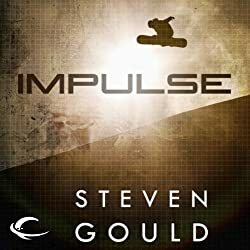 Impulse is the third book in the Jumper series and continues 10 years after Reflex ends. Davy and Millie have a teenage daughter named Cent who desperately wants to go to a "normal" high school and be around people her own age. She is around the same age Davy was when he first discovered his abilities and fears for his daughter’s safety, and with everything that happened in the Reflex story, who could blame him. Emily Rankin does a fine job narrating this story, it took me a long time to get used to her voice and cadence, by the end of the book I could only think of her voice as being Cent’s voice. But every time she was reading as Davy or Millie it really hurt my brain. Cent has a secret. She lives in isolation, with her parents, hiding from the people who took her father captive and tortured him to gain control over his ability to teleport, and from the government agencies who want to use his talent. Cent has seen the world, but only from the safety of her parents’ arms. She’s teleported more than anyone on Earth, except for her mother and father, but she’s never been able to do it herself. Her life has never been in danger. Until the day when she went snowboarding without permission and triggered an avalanche. When the snow and ice thundered down on her, she suddenly found herself in her own bedroom. That was the first time. ©2013 Steven Gould (P)2012 Audible, Inc. I rate this book an 8 out of 10 and recommend it to anyone who like science fiction and superpower books. 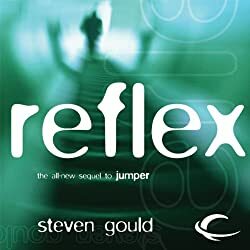 Reflex is the second book in the Jumper series by Steven Gould. This story has a split focus. One half of the story follows Davy and what he goes through while held captive by the mysterious bad guys and the other half follows his wife Millie and her… Whoops, almost let some major spoilers go there. This story is as good if not better than the first one. We get to dive more into who Davy has chosen to be as a person and get to know Millie a lot better. A very nice read indeed. Macleod Andrews does a very fine job narrating the story and I will always think of he voice as being Davy’s. Davy has always been alone. He believes that he’s the only person in the world who can teleport. But what if he isn’t? A mysterious group of people has taken Davy captive. They don’t want to hire him, and they don’t have any hope of appealing to him to help them. What they want is to own him. They want to use his abilities for their own purposes, whether Davy agrees to it or not. And so they set about brainwashing him and conditioning him. They have even found a way to keep a teleport captive. But there’s one thing that they don’t know. No one knows it, not even Davy. And it might save his life…. ©2004 Steven Gould (P)2011 Audible, Inc. I rate this book an 8 out of 10 and recommend it to anyone who likes science fiction and superpower books. I enjoyed the movie Jumper when it came out in 2008, but man did it have some HUGE plot holes. So when I ran out fiction books in my Audible wish list I decided to check the Jumper books out. 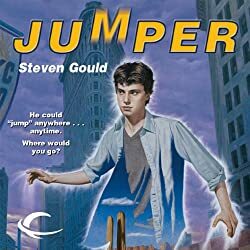 Jumper is the first book in a series of 3 by Steven Gould. The story in the movie is similar to the story in the series of books, but is not the same story. I enjoyed this book, the character Davy is likeable and believable, the narration by Macleod Andrews is good, and the story is good science fiction. When I was in my teens I spent a lot of time thinking about what it would be like to have superpowers. Most of the time the ability to be invisible was at the top of my list, but now I think that being able to teleport or jump may be an even better power. Davy can teleport. To survive, Davy must learn to use and control his power in a world that is more violent and complex than he ever imagined. But mere survival is not enough for him. Davy wants to find others like himself, others who can Jump. ©1992 Steven Gould (P)2011 Audible, Inc. I rate this book an 8 out of 10 and recommend it to anyone who likes science fiction/superpower books.